General Electric Company (NYSE: GE) is one of the world’s largest industrial conglomerates. The company is well-positioned in the market. But its stock has substantially underperformed its peers over the past decade. Honeywell International Inc. (NYSE: HON) shares have risen 183 percent over the past 10 years and is profiting from the climate change market. United Technologies Corporation (NYSE: UTX) has also gained about 172 percent in the same period. In contrast, General Electric has declined 23 percent over the last decade. That beefed up pressure on General Electric CEO Jeffrey Immelt to restructure the company and boost shareholder value. In December 2012, Immelt pledged to shed off non-core assets, and focus mainly on the industrial business of the company. 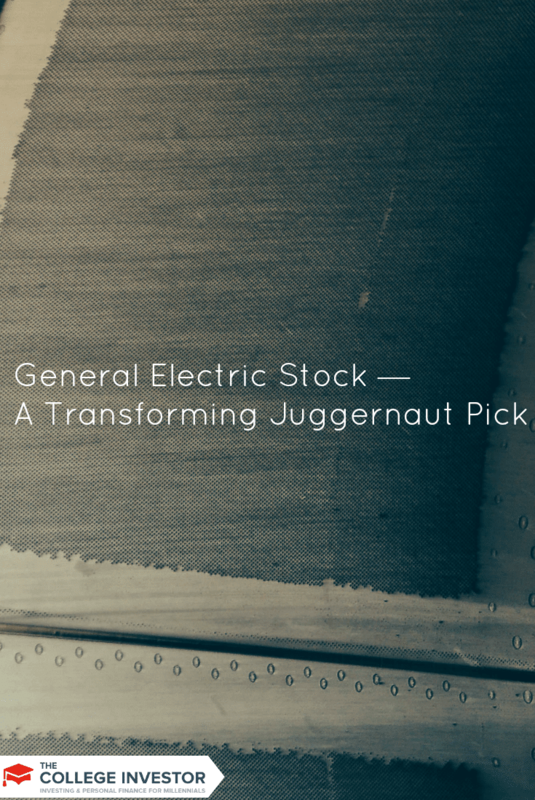 The 57-year-old chief of General Electric is working to position the company as an infrastructure manufacturer producing big-ticket and complex items like jet engines, power generators, and locomotives. Jeffrey Immelt has started offloading assets that fall outside the industrial operations. Earlier this year, the company sold its entertainment unit NBC Universal for a whopping $16.7 billion. General Electric has also exited its plastic and reinsurance businesses. Last month, the American multinational sold its apartment portfolio to The Blackstone Group for $2.7 billion. In August, General Electric also announced to exit its consumer lending business, which is an arm of GE Capital. According to The Wall Street Journal, the retail finance arm generated $2.2 billion in profits last year. Selling the business would have been an ideal move. But given the size of the consumer finance business, it’s hard to find a suitable buyer. So, General Electric decided to spin off the business through an IPO. The consumer lending arm issues credit cards to more than 55 million customers at retailers like Banana Republic and Walmart. The recent sales of its non-core businesses have boosted General Electric’s cash reserves to $19.3 billion. That has prompted Jeffrey Immelt to spend a part of the cash pile to make some strategic acquisitions that will boost GE’s industrial operations. On August 27, GE spent $552.2 million to purchase a 15 percent stake in China’s XD Electric Group. General Electric plans to double its power transmission product sales to $4 billion over the next decade. XD Electric Group makes circuit breakers, high-voltage transformers, and capacitors. Moreover, Jeffrey Immelt aims to boost GE’s oil and gas business. It has been the fastest growing division of General Electric since 2008, according to Bloomberg. In July, the company acquired Lufkin Industries Inc. in a $3 billion deal. The ongoing shale oil boom makes GE’s oil and gas business an attractive play. The division has grown mainly through acquisitions. 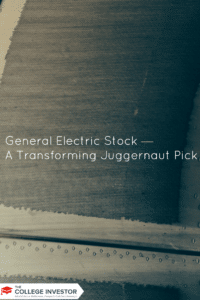 Apart from Lufkin Industries, GE has also purchased Dresser Inc. and the well-supported arm of John Wood Group PLC, adding them to its oil and gas portfolio. That increased the division’s annual revenue by 54 percent since 2008 to $15.2 billion in 2012. It’s clear that Immelt wants to take advantage of the shale drilling boom in the period of natural gas revolution. American oil and gas services firms are currently growing at 35 percent per year. Research firm Bernstein said that it sees Dresser-Rand and Dril-Quip as potential acquisition targets for General Electric. Both companies are headquartered in Houston. Dresser-Rand has a market value of $4.7 billion, while Dril-Quip is valued at $4.3 billion. Though over-diversification could prove harmful for a business, healthy diversification is a good thing. And General Electric is an excellent example of healthy diversification. 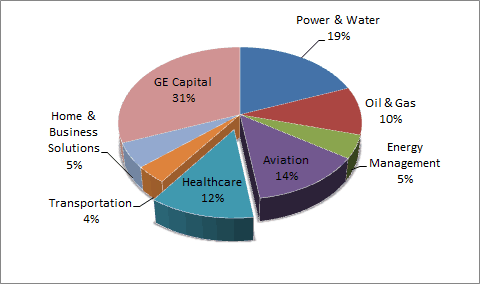 GE Capital accounts for a little less than one-third of its revenues (see the pie chart below). But the company is breaking GE Capital into smaller pieces to offload them (e.g., consumer lending business). Rising demand for quality healthcare in emerging markets offers solid growth opportunity for its healthcare division. The company’s aviation arm is also expected to benefit from long-term demand of jet engines in emerging markets. General Electric is committed to boosting shareholder value. Immediately after selling its stake in NBCUniversal for $16.7 billion, the company said that most of the proceeds will be used for share buy-backs. The company plans to reduce the total number of outstanding shares to less than 10 billion. Based on its current price, GE will have to spend $4.3 billion to achieve that goal. Over the past two years, the company has increased dividends by eight cents annually. GE usually announces dividend increases during the fourth quarter. Since the 2008 financial crisis, the company has almost doubled its annual dividend payout. Though an increase is never guaranteed, analysts expect the company to raise its dividend in line with EPS growth this year. The company has planned to return $18 billion to shareholders this year. Of which, it has already returned about $10 billion to stock repurchases and dividends. The continued transformation of the company should unleash huge shareholder value. General Electric plans to become a pure play industrial conglomerate. The company should benefit from growing demand of big-ticket industrial products. The stock represents strong value. It gives 3.15 percent annual dividends. With a P/E ratio of 17.16, the stock is cheaper than its rivals Honeywell International and United Technologies that have a P/E ratio of 20.98 and 19.63 respectively. What are your thoughts on the transformation of General Electric? Vikas is a professional financial journalist and value investor with more than four years of investing experience. Vikas spends most of his time reading investment books, writing about finance and looking for stocks that have significant growth potential. Having bought GE before the 2008 meltdown due to its stellar dividend history and prospects and subsequently gotten slammed, I hope you’re right! Hi Kurt, GE slashed dividend substantially during the 2008 financial crisis. But the company has been increasing dividends consistently since coming out of the crisis, and I expect the trend to continue. Good Luck! I own GE because it bought a company I owned shares in. It represents a portion of my asset allocation which I feel is more conservative. Thanks for the fundamental view. Coincidentally, I just finished doing a technical analysis of GE for the purpose of finding day-trading opportunities on the stock. (I know, I know – crazy.) Anyway, the main opportunity I found occurs on Gap-UP days where the gap doesn’t get closed. I analyzed 13 years of data and found a signal with an 66% win rate. It only occurs about twice a month, and you won’t get rich trading it, but it was fun to know a (relatively) low-volatility stock like that could still present technical day trading opportunites.